Hamam beneath Hassan II Mosque. Not a typical hamam at all, but certainly beautifull! In Morocco, the norm is to take a weekly shower, most often at a local hamam. Hamams are a public bath-house that usually features several large, open rooms with spigots of hot and cold water lining the walls. The innermost room will likely resemble a hot sauna, with the rooms growing gradually cooler as one moves outwards. A 25-35 Dirham door charge gives you unlimited access to the space and water provided. You bring everything else. By everything else, I mean a bucket(s), a stool, sandals, pitcher, shampoo, soap, scrubbers, exfoliators, conditioners, skin conditioners, face wash, henna wash, razors, rubbing cream (at least, that is what I am translating it as, rather cool stuff that you scrub into your skin after you have completed all of our other grooming), brushes, combs, change of clothes, warm jacket, sweater, bathrobe, towel, hat, scarf, and perhaps another hat just for good measure. You can easily pick out the men and women heading to and from hamam because they will be carrying a massive duffle bag on one shoulder while balancing a stack of three or four buckets and stool on the other. 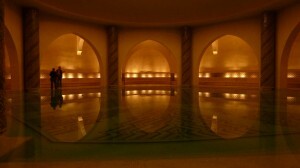 A typical visit to the Hamam will last a good three hours. On my last visit, I felt rubbed raw, but also certain there was not a single dead cell left on my body. And the experience is miraculous. I continue to feel clean and fresh for many days after a visit, and it is only when approaching hamam time again that I begin to feel as though I should visit the showers. Basic protocol at the hamam is to fill your various buckets with the combined hot and cold water from the taps. Then you drag your buckets into whatever respective corner you have staked out for yourself (usually maintained by the sister/aunt/mother/friend who has accompanied you. Sitting upon your stool, pitcher in hand, you slowly pour water over yourself, careful not to splash too much, and especially not to accidentally shower your neighbor, which is considered the height of poor manners. The rest I think is fairly strait-forward and you can fill in for yourself. Among the other students in the SIT program, only about half of their host families have a shower at home. This does not really have to do so much with economics and simply who’s house happened to have a personal shower installed and whose does not. It is fairly similar with Western toilets. Some homes have come with them, most do not (it is interesting to note that a few families here in Rabat have been hosting SIT students for nearly fifteen years, and they have chosen to install western toilets to accommodate their students). My house happens to be one that does indeed have a shower (incidentally, one of the very first things my host mother did when I first arrived in her home was to tell me to get undressed and jump in the shower, even though it was only about three in the afternoon and I had actually showered that morning in the hotel. I believe she chose to do this as a sign that I am welcome to use the shower whenever and as often as I like, so that I might feel at home) (all of these parenthetical side stories, I promise I am going to get to my real story soon!). I have quite easily transitioned into the once-a-week bathing routine, but as we have a shower here in the house, I most often take my hamam at home, privately. For one, Wafaa, my youngest host sister, personally prefers the privacy. The local hamams are completely filled with stark naked women gossiping in their sandals while secretly (read: silently) bickering over the line for hot water taps. Private hamam is different from a shower. You still fill your bucket with hot water, you still sit on a stool and rub yourself raw, and you still spend a long time rinsing and re-rinsing yourself. However, you miss out on the sauna hot air, and so that long time gets reduced to a single bucket or two’s worth of scorching water. Today has been a long, cold, rainy winter day. In the morning I had an assignment to visit several different NGOs in the surrounding area of Rabat. I found myself with a group of cold miserable SIT students repeatedly being confounded by language and navigational miscommunications. By the time we took our lunch in a local café and checked back into our classrooms this afternoon, we were all ready for a change of clothes and warm bed. Evidently some of this fatigue was evident upon my face and body when I stumbled home this afternoon, as my mother took one look at me and asked in French “douche? Douche!” and without really waiting for a response, relieved me of my backpack, jacket, and hat. She then left the rest to me while she turned on the hot water and gathered a stool and bucket for my wash. When I stepped out, dressed only in a towel and sandals, she held a lit candle out to me, and indicated the light in the shower and the kitchen both were out of commission. Together we jimmied together a candle-holder out of a Clorox carton from under the sink and set it in a far corner of the shower. She hung a curtain across the open face of the shower, as either of my host brothers would be returning from school/work at any time and left me to my devices. I have, since the first time I tried it, felt that pouring pitchers of hot water while poised on a stool to be a rather sensual and therapeutic indulgence for myself. I can’t help but feel entirely pampered and in some ways seductive. I never would have realized just how much a single candle could have possibly enhanced and highlighted the serene warmth and seductive calm of hamam. I encourage every stressed and irritated woman (or man, I suppose) to give it a try. Nothing has ever felt so cathartic.